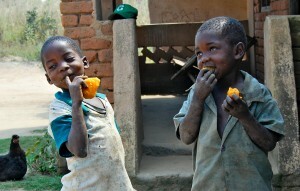 Children enjoying orange sweet potato. Credit, HarvestPlus. Billions of people around the world suffer from ‘hidden hunger’ or micronutrient malnutrition. Around 805 million people were considered chronically undernourished over the 2012-2014 period. Whilst this has decreased by more than 100 million people compared to the previous decade and the prevalence of undernourishment has also fallen by 42%, micronutrient deficiencies affect an estimated 2 billion people or one-third of the world’s population. Those that do not get enough micronutrients from the foods they eat such as Vitamin A, zinc and iron, face severe health complications and even death. Micronutrient malnutrition can lower IQ, cause stunting and blindness in children, lower resistance to disease in both children and adults, and increase risks for both mothers and infants during childbirth. Malnutrition is the underlying cause of 45% of child deaths under the age of 5. In 2013, an estimated 161 children under the age of 5 were stunted (below median height for age) and another 51 million were wasted (below median weight for height). High-iron beans in Rwanda. Credit, HarvestPlus. Nutrition is a complex issue, with many factors that contribute to malnutrition. In rich countries, poor food choices, lifestyle habits and poverty can lead to nutrient deficiencies. To combat malnutrition, staple foods are regularly fortified with vitamins and micronutrients. Some common examples include fortifying milk and orange juice with vitamin D and bread with folate or salt with iodine. This process of fortification is completed during the food processing stage when nutrients are ‘added’ into the food. Although fortification enables people to consume required nutrients without extra effort, in poor countries, where diets often lack diversity and most people rely on a major staple that offer calories but often inadequate nutrients, fortification may not be the best strategy to reduce malnutrition. The prevalence of and accessibility to super-markets and processed food products is growing in developing countries, but many rural poor communities, especially farming communities, often lack access or means to purchase processed foods. Therefore, fortification of manufactured foods would have limited impact on improving nutrition for these populations. Biofortification – a process by which the nutritional quality of a food crop is enhanced through plant breeding – offers a way to reach these remote and resource-poor populations and effectively reduce malnutrition in rural areas. Biofortification is an example of genetically intensifying a major staple to produce multiple benefits. 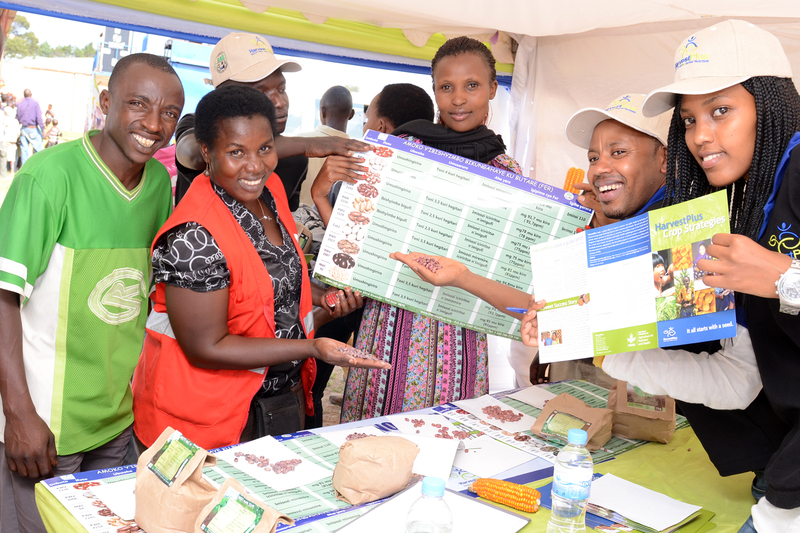 First, biofortification capitalises on the regular daily intake of a large amount of food staples thereby implicitly targeting low-income households. Second, after the one-time investment to develop seeds that are fortified, recurrent costs are low, and germplasm can be shared internationally. This multiplier aspect of plant breeding across time and distance makes the investments cost-effective. Third, once in place, the biofortified crop system is highly durable. Nutritionally improved varieties will continue to be grown and consumed year after year, even if government attention and international funding for micronutrient issues fade. Fourth, biofortification provides a feasible means of reaching undernourished populations in relatively remote rural areas, therefore, highly complementary with fortification. Finally, breeding for higher trace mineral density in seeds will not incur a yield penalty. In fact, biofortification may have important spin-off effects for increasing farm productivity in developing countries in an environmentally beneficial way. Biofortification is a relatively new field, but is proving to be a cost-effective, innovative approach to growing staple crops that are rich in vitamins and minerals. Yet, the success of biofortification is dependent on more than just genetics – targeting, economic feasibility, adoption, and consumer acceptance are all necessary conditions. The evidence base for demonstrating a clear connection between consumption of biofortified crops and improvements in nutritional status of targeted groups remains sparse, but emerging results are positive. Orange-fleshed sweet potato (OFSP), the first biofortified crop to be introduced, produced and marketed on a large scale, has increased vitamin A intake and levels in young children in Mozambique and Uganda. Among treated households, the amount of inadequate vitamin A intakes fell by 25-33% among children aged 12-35 months in Mozambique and by 31%-34% among the same group in Uganda. Among mothers of childbearing age, the amount of inadequate vitamin A intakes fell by 20-35% in Mozambique and 26-36% in Uganda. 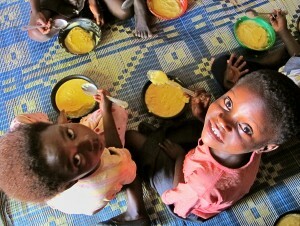 Maize conventionally biofortified with zinc has also shown higher levels of zinc absorption in Zambian children. In fact, the zinc absorbed from traditional meals of porridge made with biofortified maize was higher than the physiological requirements for children between the ages of one and four and double the amount absorbed from post-harvest fortified maize flour. The study also found that zinc losses can be minimised during processing by using closed hammer or roller mills (different methods for braking down grain into small particles either by the use of pounding with a hammer or tearing with rollers moving at different speeds). Biofortified crops are also enjoying high rates of adoption and consumption HarvestPlus calculates that more than 1 million farmers planted biofortified crops by the end of 2013. Iron beans were delivered to 175,000 households in eastern Democratic Republic of Congo (DRC) and 50,000 households received iron bean seed in Uganda in 2013. Also in 2013, more than 100,000 Nigerian farmers planted vitamin A cassava whilst vitamin A ‘orange’ maize reached more than 10,000 Zambian households. In Mozambique, up to 79% of those farmers studied were growing OFSP at the end of the project. The total area devoted to sweet potatoes increased from 11%-20% to 70% and 73% over the same period. Average dietary intakes of vitamin A increased substantially in both Mozambique and Uganda. Biofortified staple foods cannot deliver as high a level of minerals and vitamins per day as supplements or industrially fortified foods, but they can help to bring millions of people over the threshold from malnourishment to micronutrient sufficiency. Using the Disability-Adjusted Life Year (DALY) framework as part of an ex-ante analysis, researchers concluded, “Developing and disseminating biofortified crops is a highly cost-effective means of reducing micronutrient malnutrition in the developing world.” Biofortified beans, cassava, maize, rice, sweet potato and wheat in 12 countries in Africa, Asia and Latin America were analysed. In an optimistic scenario, vitamin A deficiency could be reduced at the cost of less than US$20 per DALY averted (i.e. per year of life not lost), with the exception of cassava in northeast Brazil which exceeded $1,000 per DALY averted. Again, under an optimistic scenario, reducing iron deficiency was projected to cost US$1-$3 per DALY averted for wheat in South Asia, US$3-$5 for rice in South Asia, US$55 for rice in the Philippines and US$20-$66 for beans in Latin America. Under a pessimistic scenario, the costs more than double. For reducing zinc deficiency, the results were similar: under optimistic scenarios, it cost US$1-$2 per DALY averted for wheat and rice in South Asia and US$12 for rice in the Philippines. Crops can be improved to produce higher levels of certain desired nutrients by manipulating their genetic makeups. This can be done through conventional plant breeding or genetic engineering. The majority of biofortified crops available today are bred through conventional means. To biofortify a plant through conventional breeding requires (1) searching gene banks for germplasm with desirable qualities; (2) testing many wild relatives of a domesticated crop for a certain nutrient; (3) selecting the ones that contain higher levels of that nutrient; and (4) crossing those wild relatives with the domesticated crop. The crossings can remove desired qualities of the domesticated crop, such as edibility (many wild relatives are inedible), appeal and yield. As a result, it often takes a long time for crops to become biofortified so that varieties meet both nutritional and cultural demands. In the case of genetic biofortification, relying exclusively on conventional breeding is not always expedient. Marker aided selection is a common approach to biofortification. Moreover, some traits—like the accumulation of vitamin A in the endosperm of rice—cannot be achieved through conventional breeding; if desired traits are not present in any variety of the crop, cross-breeding is not an option. Hence, in some cases, biofortification requires the use of genetic engineering. Using more advanced breeding technologies also facilitates the stacking of different traits in one plant, and it can speed up the overall development process. There is a theoretical risk that a gene inserted by a genetic engineering (GE) process (such as the gene that codes for beta-carotene, the precursor of Vitamin A) could pass to related crop or wild plants with unknown effects. There is no evidence to support this risk but for this and other reasons GE crops require mandatory field-testing to assess environmental risks. These are likely to be costly and regulations in many countries may mean that a GE approach to biofortification is only justified if using a conventional breeding technology is impossible. In general GE approaches face resistance in many countries. Marketing in the developing countries is not easy and consumer acceptance is essential for a biofortification strategy to reduce malnutrition. Biofortified staple foods can contribute to body stores of micronutrients such as iron, zinc, and vitamin A throughout the life cycle, including those of children, adolescents, adult women, men, and the elderly. The potential benefits of biofortification are, however, not equivalent across all of these groups and depend on the amount of staple food consumed, the level of micronutrient deficiency, and the micronutrient requirement as affected by daily losses of micronutrients from the body and special needs for processes such as growth, pregnancy, and lactation. Therefore, biofortification alone is unlikely to reduce micronutrient deficiencies in full; it will need to be coupled with other interventions. The permanent solution to addressing micro-nutrient deficiencies in developing countries will require efforts across multiple government ministries, improvements in health education, adequate supportive policies and the accessibility of diverse diets consisting of fruits, vegetables, legumes, fish, grain and other animal products. Until there is greater investment in agricultural development and rural economic development, alongside improved coordination with education and health interventions, this may be slow to realize. Food and Agriculture Organization of the United Nations (FAO) 2014, The State of Food and Agriculture 2014: Innovation in Family Farming FAO, Rome. Micronutrient Initiative 2009, Investing in the Future: A United Call to Action on Vitamin and Mineral Deficiencies Micronutrient Initiative, Ottawa. World Health Organization (WHO), Global Database on Child Growth and Malnutrition, Available from: <http://www.who.int/nutgrowthdb/about/en/> [1 July 2015]. Thompson, A, Blossner, M, Borghi, E, Feng, J & Mistiaen, J 2013, Levels and Trends in Child Malnutrition, UNICEF-WHO-The World Bank, Joint Child Malnutrition Estimates, Available from: <http://www.who.int/nutgrowthdb/summary_jme_2013.pdf> [1 June 2015]. Bouis, HE, Low, J, McEwan, M & Tanumihardjo, SA 2013, Biofortification: Evidence and lessons learned linking agriculture and nutrition, Food and Agriculture Organisation of the United Nation (FAO) and World Health Organisation (WHO), Rome and Washington, DC. HarvestPlus 2012, Disseminating Orange-Fleshed Sweet Potato: Findings from a HarvestPlus Project in Mozambique and Uganda, HarvestPlus, Washington, DC. de Brauw, A, Eozenou, P, Gilligan, D, Kumar, N & Meenakshi, JV 2012, ‘Biofortification, crop adoption and health information: Impact pathways in Mozambique and Uganda’ Selected paper at the Agricultural and Applied Economics Association Meeting, Available from: <http://www.a4nh.cgiar.org/files/2013/06/BiofortificationCropAdoptionAndHealthInformation1.pdf> [1 July 2015]. Meenakshi, JV, Johnson, NL, Manyong, VM, DeGroote, H & Javelosa, J 2010, ‘How Cost-Effective is Biofortification in Combating Micronutrient Malnutrition? An Ex Ante Assessment’ World Development, vol. 39, no.1, pp. 64-75. Lim, XZ, 2014 ‘Biofortification: New ‘Green Revolution’ for more nutritious crops’ 29 October 2014, Genetic Literacy Project Available from: <http://www.geneticliteracyproject.org/2014/10/29/biofortification-new-green-revolution-for-more-nutritious-crops/> [1 July 2015]. In 2010, the Rwandan government introduced 4 high-iron biofortified varieties of bean. This was followed by a second wave in 2012, developed by the Rwanda Agriculture Board (RAB), the International Center for Tropical Agriculture (CIAT) and HarvestPlus. In 2012, 38% of Rwandan children under five and 17% of adult women were iron deficient. By 2014, more than 270,000 households or 15% of farmers were growing and eating the biofortified beans. These beans contain 14% more iron than commonly grown varieties. Given that Rwandans eat on average 200g of beans per day, the iron beans can provide 45% of their daily requirement of iron. HarvestPlus aims to continue to enrich their beans, with the goal of providing 60% of daily iron needs. The beans are also bred to be high yielding, virus resistant and heat tolerant. Preliminary evidence shows that consumption of iron fortified beans can increase iron status in iron-depleted Rwandan women. For example, iron-depleted female university students showed a significant increase in haemoglobin (by 3.5g/L) and total body iron (up by 0.45mg/Kg) after consuming biofortified beans for 4.5 months. HarvestPlus also released iron beans in the Democratic Republic of Congo where they are being planted by 175,000 households and in Uganda, where vitamin A enriched orange-fleshed sweet potato is already widely produced and consumed. Johnson, N, Guedent, H & Saltzman, A 2015, ‘What will it take for biofortification to have impact on the ground? Theories of change for three crop-country combinations’, International Food Policy Research Institute (IFPRI) Discussion Paper 01427, Washington, DC. Harvest Plus 2013, HarvestPlus Crop Strategies: It all starts with seed, HarvestPlus, Washington, DC. Iron Beans in East Africa, 2014, Available from: <http://biofortconf.ifpri.info/2014/03/10/iron-beans-in-east-africa/> [6 July 2015]. Haas, J ,Luna, S, Lung’aho, M, Ngabo, F, Wenger, M, Murray-Klob, L, Beebe, S, Gahutu, JB & Egli, I 2014, ‘Iron biofortified beans improve iron status in Rwandan University women: results of a feeding trial’ The Journal of the Federation of American Societies for Experimental Biology, vol. 28, no. 1: 646.1. 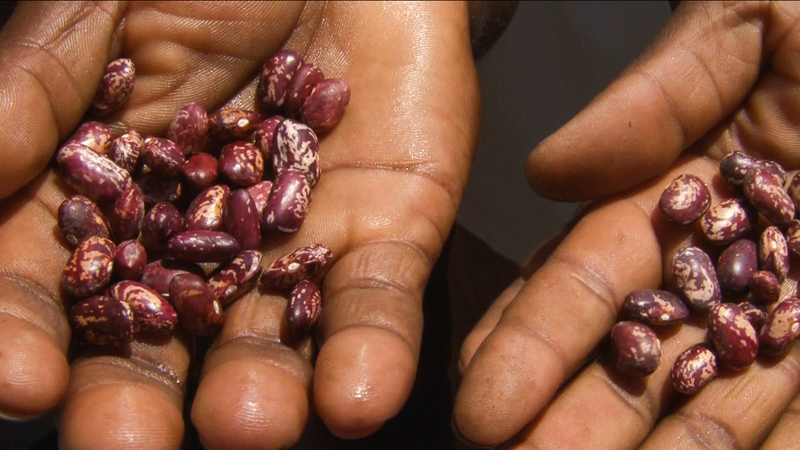 HarvestPlus (no date), Rwanda, Available from: <http://www.harvestplus.org/content/iron-beans-rwanda> [6 July 2015]. A lack of vitamin A causes blindness in 500,000 children annually and is linked to increased risk of death from disease. In Zambia, although sugar has been fortified with vitamin A since the 1990’s, a 2003 National Food and Nutrition Commission showed that 54% of children under the age of 5 remained vitamin A deficient, as well as 13% of women aged 15-49. In 2012 pre-school children in the Nyimba District of Zambia were selected to partake in a study, primarily for their willingness to participate. Children were selected who were reasonably healthy, without infection, but who had not received any vitamin A supplements in the past 6 months. Children were either fed 200g/day of white maize, the same amount of orange vitamin A fortified maize (developed by the International Maize and Wheat Improvement Centre, CIMMYT and HarvestPlus) or a vitamin A supplement. The study demonstrated that orange maize is an effective vitamin A source; those who were fed orange maize showed significant increases in their vitamin A levels. In fact, there was no statistical difference between the vitamin A levels in children who were fed the supplement and those who ate the orange maize. World Health Organisation (WHO) (no date), Nutrition: Micronutrient deficiencies – Vitamin A Deficiency, Available from: <http://www.who.int/nutrition/topics/vad/en/> [6 July 2015]. IRIN News (no date), Zambia: Orange maize to curb vitamin A deficiency, Available from: <http://www.irinnews.org/report/91049/zambia-orange-maize-to-curb-vitamin-a-deficiency> [6 July 2015]. Gannon, B, Kaliwile, C, Arscott, SA, Schmaelzle, S, Chileshe, J, Kalungwana, N, Mosonda, M, Pixley, K, Masi, C & Tanumihardjo, SA 2014, ‘Biofortified orange maize is as efficacious as a vitamin A supplement in Zambian children even in the presence of high liver reserves of vitamin A: a community-based, randomized placebo-controlled trial’ The American Journal of Clinical Nutrition, vol. 100, no. 6, pp. 1541-1550. HarvestPlus (no date), Vitamin A Maize, Available from: <http://www.harvestplus.org/content/vitamin-maize> [6 July 2015]. Feed the Future 2013, Orange Maize Improves Yields and Nutrition for Families in Zambia, Feed the Future Newsletter, Available from: <http://feedthefuture.gov/article/orange-maize-improves-yields-and-nutrition-families-zambia> [6 July 2015]. In 2011, the International Institute for Tropical Agriculture (IITA) and the National Root Crops Research Institute (NRCRI) announced the successful hybridisation and selective breeding for 3 new yellow varieties of cassava biofortified with vitamin A. Although by 2013, more than 25,000 households produced these biofortified varieties of yellow cassava, there is a long road between breeding and adoption, especially for crops that may look or taste different than local, more familiar, varieties. Improving and accelerating consumer acceptance of biofortified crops is therefore a major concern for breeders. A study carried out in the Kibwezi district of Eastern Province in Kenya tested both children between the ages of 6 and 12 and their primary care-giver (who was usually the mother, but in some cases was the father, grandparent or other adult), to establish attitudes towards switching to vitamin-A biofortified yellow-fleshed cassava. Subjects reported a significant difference in taste between the local white variety and yellow cassava. However, both groups preferred the yellow cassava because of its soft texture, sweet taste and attractive colour. Indeed, more than 70% of subjects reported a preference for the yellow cassava. Knowledge about vitamin A-rich cassava and its relation to health was a strong predictor of ‘health behaviour identity’ or the notion that the new variety is good to eat. Worries included bitter taste and colour and the care-givers’ beliefs related to having control over preparing cassava. Information sessions about vitamin A enriched cassava and recommendations from health workers were the best predictors of intention to consume new varieties. Whilst the study concluded that vitamin A-rich cassava is well accepted by school children, adoption rates could be improved by 1) reducing barriers such as worries about colour or taste; 2) increasing knowledge on the benefits of eating vitamin A cassava; 3) empowering care-givers to control decisions on what they cook; and 4) involving health workers in the promotion of the new cassava varieties. Research into the efficacy of yellow cassava in Kenya to improve vitamin A levels is due to be published in 2015. However, a HarvestPlus study on yellow cassava in Nigeria showed that the biofortified crop could provide up to 25% of the recommended amount of vitamin A for women and children. HarvestPlus aims to continue to improve the crop until it can provide more than 50% of the recommended daily intake of vitamin A.
 Talsma, EF, Melse-Boonstra, A, de Kok, BPH, Mbera, GNK, Mwangi, AM & Brouwer, ID 2013, ‘Biofortified Cassava with Pro-Vitamin A Is Sensory and Culturally Acceptable for Consumption by Primary School Children in Kenya’ PlosOne, vol. 8, no. 9, e73433, Available from: <http://journals.plos.org/plosone/article?id=10.1371/journal.pone.0073433> [6 July 2015]. 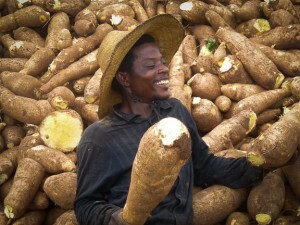 HarvestPlus (no date), Nigeria, Available from: <http://www.harvestplus.org/content/vitamin-a-cassava-nigeria> [6 July 2015].